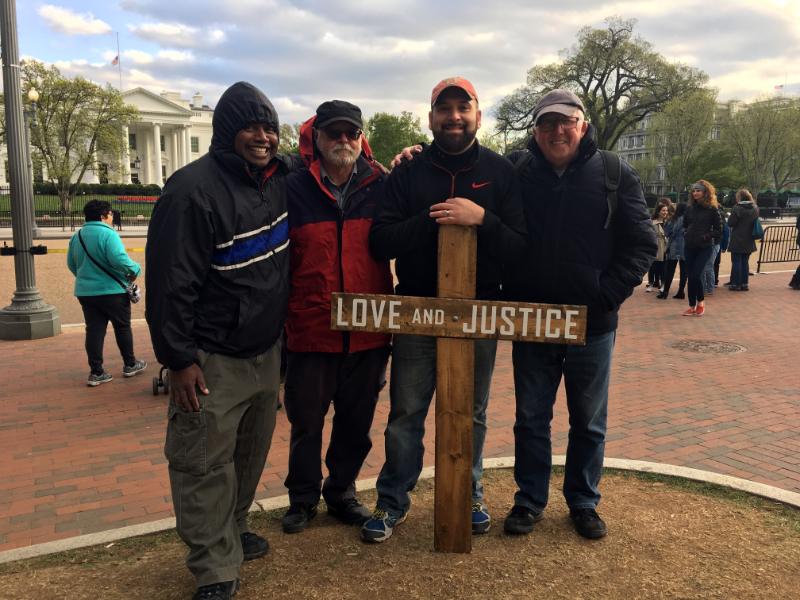 WASHINGTON, DC – By God’s grace I was able to join brothers Jimmy Hamilton, Don Karns, Michael Corral, and Hillary Toa in our Nation’s Capital to preach the Gospel. By God’s providence, I was slated to go to DC for work. 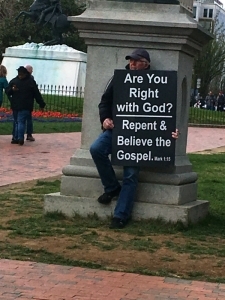 Knowing these brothers were preaching around DC, it was a no-brainer of how I’d be spending my evenings. The first evening I was able to join them was at the Lincoln Memorial. As I arrived, my pulse quickened as I was greeted with a hug from Don and Jimmy. What a joy it was to see them again! This was the first time we had preached together since our 2017 Fall College tour. After being greeted, I noticed another brother I did not know was finishing up preaching, Hillary Toa. He is a great brother to hear preach and is from Fiji. What wonderful fellowship we had together. I look forward to preaching with him in the future. After Hillary finished up, I preached my first of two messages. Many folks would stop and listen. I was shocked by how many approved the message and actually thanked us for being there. 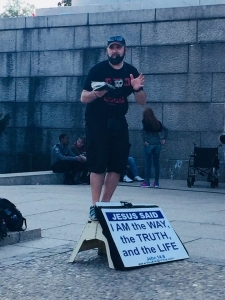 One nice thing about preaching at such tourist attractions is that there are constantly groups moving through from tour buses, so there’s no shortage of an audience to hear the message. Trying to use what was around me to grab people’s attention, I thought about Abraham Lincoln. He’s known for freeing the slaves. What better illustration to segue to everyone on earth being a slave to sin or a slave to Christ? Jesus tells us that “everyone who commits sin is the slave of sin” (John 8:34). So I used that to launch into the Gospel message. Engaging students at the White House. The next afternoon, I met up with the team in front of the White House. Like the Lincoln Memorial this too provided huge groups that came in waves. It wasn’t as fast-paced as stoplight preaching, but you had to be on your toes. About halfway through our time, someone was either coming or going from the White House. When that happens, the push everyone back into the little park across the street. 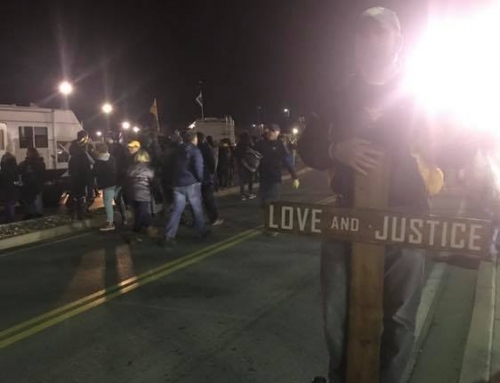 After about 10 minutes of silence, Jimmy grabbed the hailer and started preaching. When he finished, I returned to the box. Instead of the hailer, I opted to use my Aker in hopes that kids in large school groups walking by may stop an engage if there wasn’t a booming speaker. It worked. 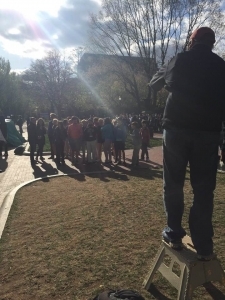 Like at the Lincoln Memorial, I used what was around me to engage the crowds with the Gospel (see footage here). I pointed out that though everyone there knows who President Donald Trump is, none could just walk up to the gate and say, “Let me in because I know President Donald Trump.” Yet, if the President knew them in a special relationship, then the would be allowed in. I transitioned that to the same way folks who claim to know Jesus but who He does not know as an adopted child through a saving relationship. Jimmy Hamilton witnessing with a sign to students visiting the White House. As school groups walked by I was able to engage them, some more than others. 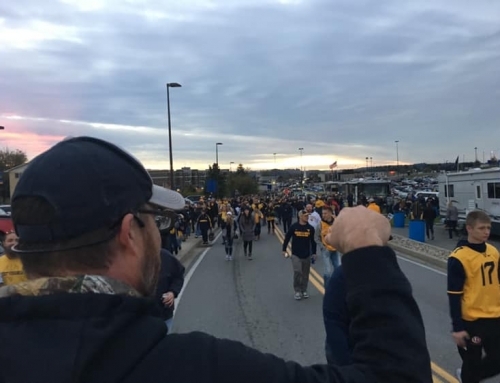 One exchange became spirited as a teacher who was not pleased with the preaching attempted to whisk his class away from us. Yet many of the kids still were listening. I pointed out that though he was an educator, he was being a fool like the Bible teaches when it comes to the message of the cross (1 Corinthians 1:18). I had another interaction with a mocking middle schooler from Connecticut. Though he and his friends were enjoying mocking and joking, I was able to use him to demonstrate the Good Person Test that everyone fails (see footage here). Many kids heard the law and it’s consequences because of him attracting attention to our exchange. What he mean for evil (mocking the Gospel), God used for good (Genesis 50:20). 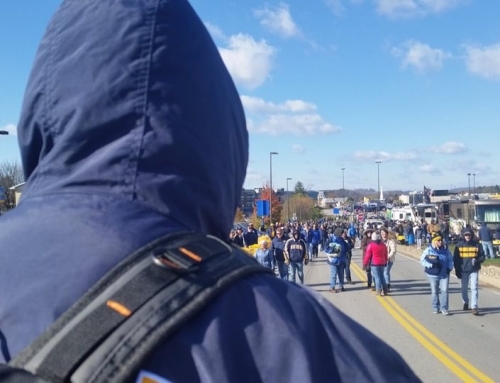 My last day in town afforded me the opportunity to join the brothers one more time. We met up just outside the Metro at Chinatown. This is a fantastic place to preach as there is tons and tons of foot traffic, especially at lunch. Additionally, the area is frequented by the hateful Black Hebrew Israelites and Jehovah Witnesses. I started off the preaching for the day. While many folks do just pass by, there are others who mill around the area there as the Metro entrance is covered and lined by a couple shops. The covered area doubles as a sound amplifier as one’s voice easily resonates around the concrete pillars and walls. As I was preaching to the first captive audience of the morning, I paid special attention to not only explain the deceptive teachings of our Jehovah Witnesses neighbors to those listening, but also called the Jehovah Witnesses to repentance. 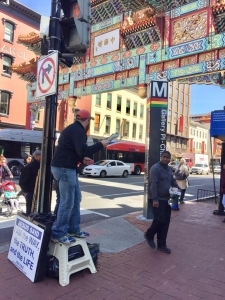 Preaching to folks passing by in Chinatown at the Archway. She looked at me with semi-teared eyes and said, “When they stand in heaven, if they don’t turn to Christ, as God sentences them to hell, they’ll remember that day a man stood on the corner and told them the truth…” That just blessed my spirit that she understood. She was so moved by the preaching and our presence, she asked Don for some tracts and began handing them out for us! I continued on for a while continuing to circle back around with the Gospel as the crowds interchanged. And I was continuous in my efforts to call out to the Jehovah Witnesses that continued to stand stoically as the preaching continued. At one point a man passed by mocking the preaching of the Gospel. He stopped by the Jehovah Witnesses and assured them he was pleased with their approach, rather than, “…what that guy is doing over there with a speaker!” I called out to him explaining that, yes, I was raising my voice so all could hear because this was a life-saving message and that what the Jehovah Witnesses were peddling was comfortable because it was a false gospel. I pleaded with him as he mocked and continued to walk away. After I finished, Don continued followed by Jimmy. 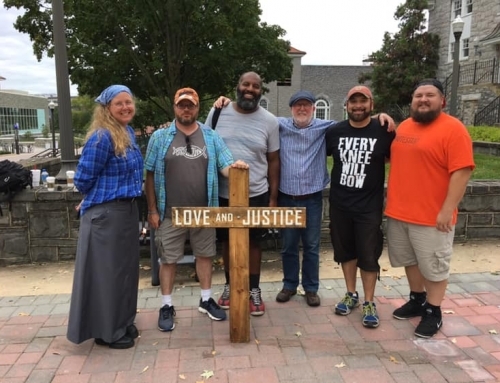 While each of them were preaching, I stood nearby with our cross with the “Stop and Talk” side facing folks passing by. As I stood next to others near the Metro entrance, I caught a choking whiff of marijuana. I did not know that Washington, DC had legalized it for recreational use. There wasn’t anywhere to escape it as it continued to swirl around the Metro entrance, so I spent the rest of the time with the cross diagonally across the street with tracts. All in all, my first time preaching in Washington, DC was a memorable one. My favorite spot was definitely the Lincoln Memorial as it has an amphitheater feel to it and no shortage of folks to preach to as there’s a never-ending line of charter buses dropping tourists off. And even more than that was the pure joy of fellowship with these dear brothers. 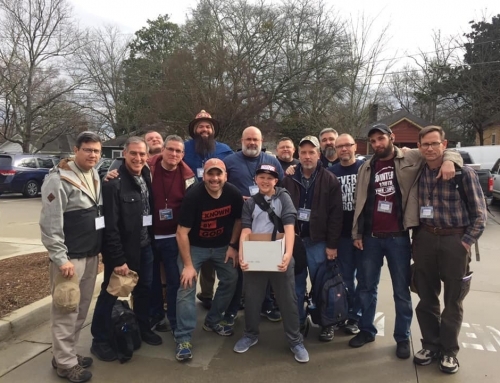 The fellowship of street preaching brothers, there’s nothing like it!